Rajma is made in the North side of India. North Indian people make this in almost every occasion. Their speciality is Rajma-Chawal. Red Kidney beans are soaked for overnight and cooked in a rich, thick creamy gravy on slow heat. Slow cooking makes this rich and flavorful in taste. This curry goes best with Rice plate, like Jeera rice or Peas Polao. But one more thing is important for a good delicious Rajma recipe is the main ingredient of the recipe, Rajma Or Red Kidney Beans. The Rajma should be fresh, I mean it should not older than 6 months. Otherwise the Rajma will not be the best in taste. I had this in a Roadside Dhaba, long yrs back. But I can still remember the taste. While one of my North Indian Family friend was coming to my place I decided to make this for him. And you know what-- he just loved the dish. so here is the recipe which I made for my friend... Rajma is a popular Indian vegetarian dish consisting of red kidney beans in a thick gravy with lots of Indian whole spices and usually served with rice and roti. Although the kidney bean is not of Indian origin, it is a part of regular diet in Northern India. The combination of Rajma and rice generally lists as a top favorite of North Indians. Rajma is made in the North side of India. North Indian people make this in almost every occasion. Their speciality is Rajma-Chawal. 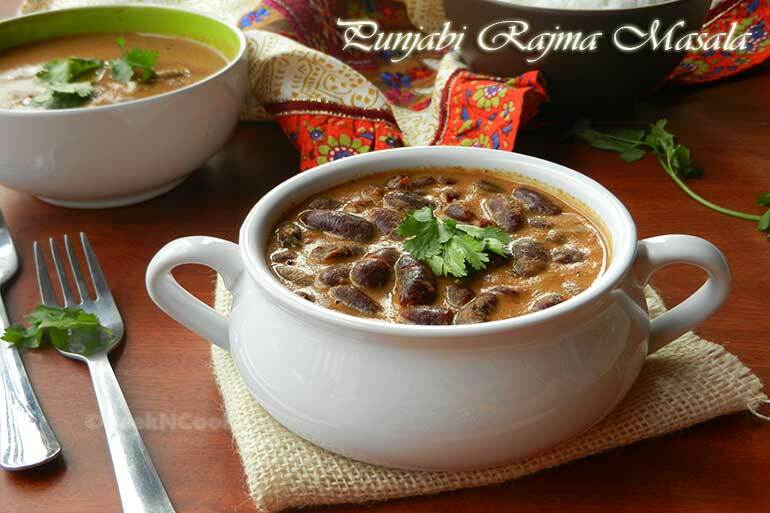 Take a Pressure cooker and add the overnight soaked Rajma into it, add 3 cups of water. Now take a very 6/6 inch cheese cloth and place the Whole spices at the middle of the cloth and tie the 4 corners of the cloth to make it a small bag, but make sure the spices should not come out from the bag and put the bag inside the Pressure Cooker. Now take another Cloth and place the Tea Leaves at the middle and tie the 4 corners and make a bag in the same way you did for the Whole Spices bag. Put this bag also inside the Cooker , add some salt and close the lid. Put the cooker on high heat and wait for 6 to 7 whistles. Turn off the heat and keep aside the cooker to release the pressure itself. When all the Pressure will be released open the lid and remove the small bags from the Rajma. Now take a non-stick pan, heat oil in it, add Cumin seeds and wait for splattering. When seeds will start splattering add the Onion Paste and fry till the paste becomes light brown. Add Ginger & Garlic paste to the pan and fry again. now add Turmeric, Cumin powder, Coriander powder & Red Chili powder to the pan and 1-2 tablespoons of water and fry again. Add the Tomato Puree and cover the pan to cook the Tomato for 2-3 minutes. After 2-3 minutes open the lid and add Salt & Sugar and stir till oil oozes from the masala. When it will start doing that add the boiled Rajma, Crushed Kasoori Methi to the pan and add 1/2 cup water too. Cover the pan and let it cook on medium heat for 10 minutes. After 10 minutes open the lid turn off the heat and add the Fresh Cream and mix well with the Rajma Masala. Serve hot with Plain Or Jeera Rice.